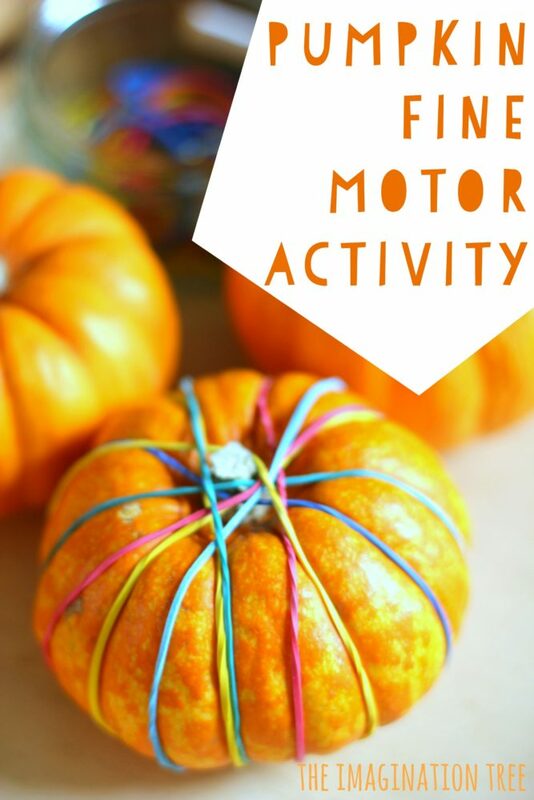 Set up a fun, no preparation, pumpkin fine motor skills activity for Autumn play and learning! This combines motor skills and creativity and is a great hand strengthener for pre-writing development. 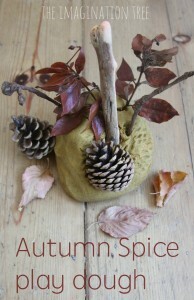 Last Autumn we set out an invitation to play with pine cones and rubber bands which was s popular with the kids and also looked lovely once completed. 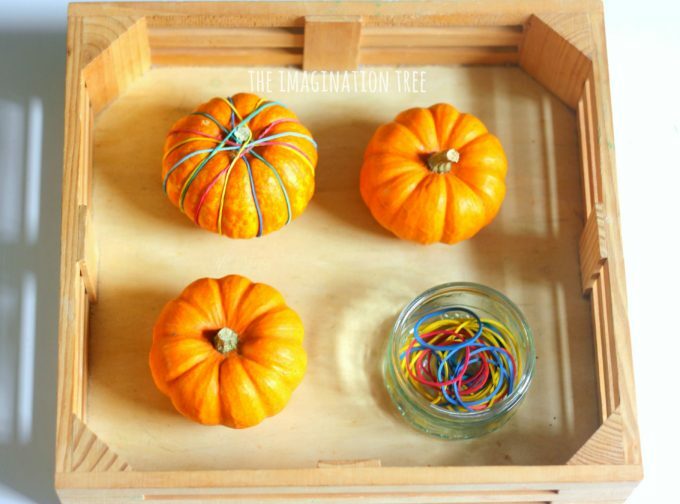 This year I found some mini “munchkin” pumpkins in the supermarket and set them out in the same way, in a tray alongside a dish of coloured rubber bands. 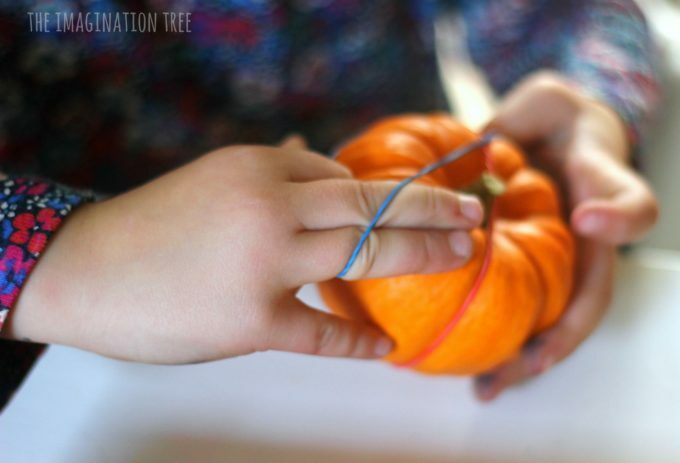 The pumpkins had segmented sides which lent themselves perfectly to this activity, as the rubber bands stayed in place and didn’t slip. Miss 4 enjoyed this the most and it took her a while to work out how to open up the band wide enough to stretch it around the circumference. Once she had figured out how to get the band onto her fingers and use her thumb as the way to open it out, she managed to wrap lots of bands around them. 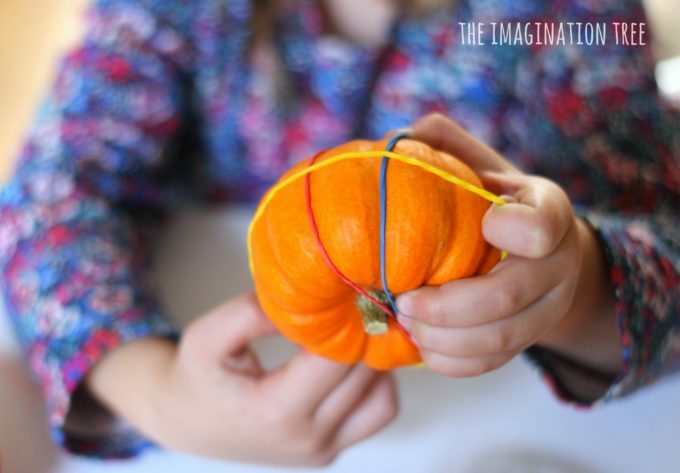 The criss-crossing of the rubber bands actually made a lovely effect, reminding me of the pumpkin string art project that we made a few years back too! 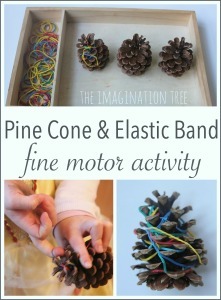 This would be a great set up in a classroom fine motor skills table or Funky Fingers activity area! Add a timer and see how many they can get on in a minute for extra fun. 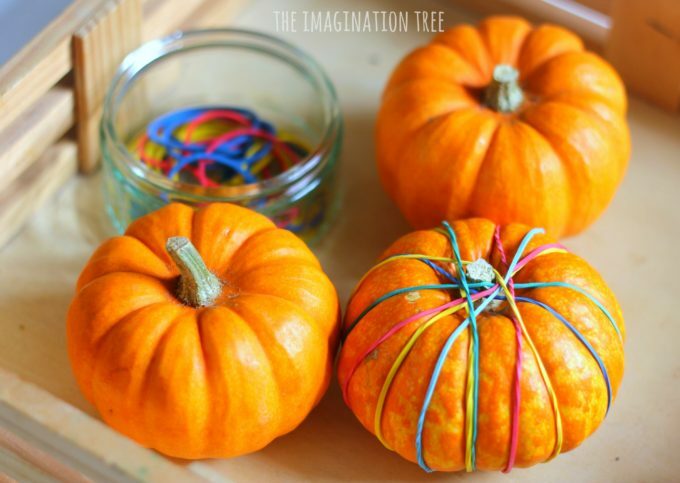 Maybe use larger pumpkins and find more materials to wrap around them too! 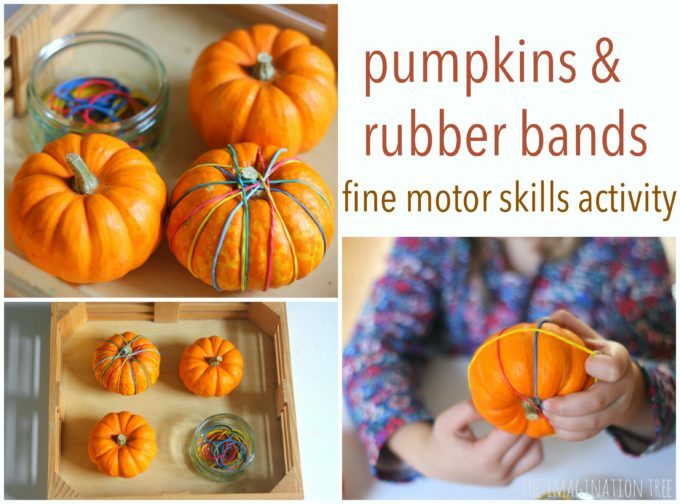 If you enjoyed this pumpkin fine motor skills activity you will probably love our Autumn play and learning ideas collection too! 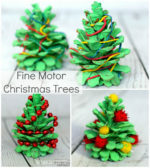 We have a whole Fine Motor Skills Activities collection here to browse for more inspiration. 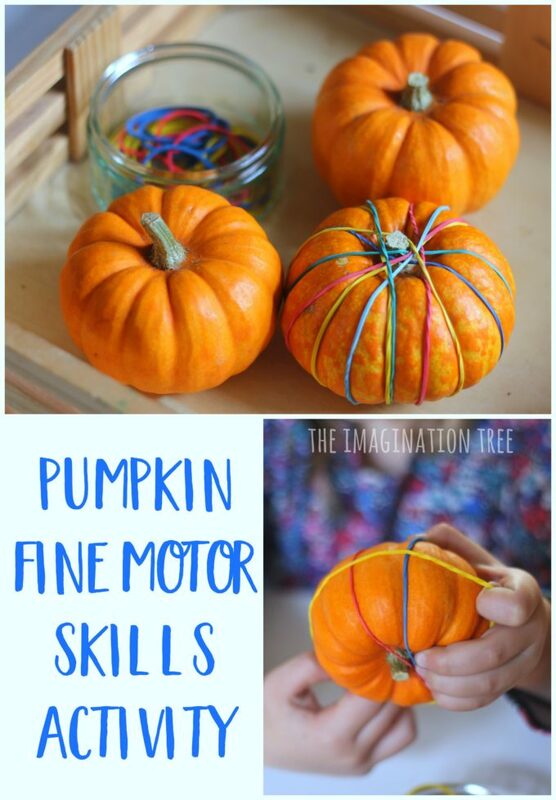 We have been looking for some pumpkin themed activities to try and this is definitely going on the list, it’s fab! 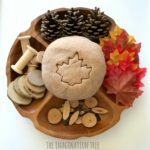 I really like this idea, it’s so simple but really helps the kids work on their fine motor skills, and the set up is very inviting. 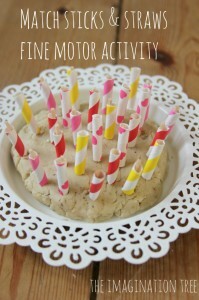 You could also use this as a “minute to win it” game with older children! This looks like a great seque into painting pumkins. 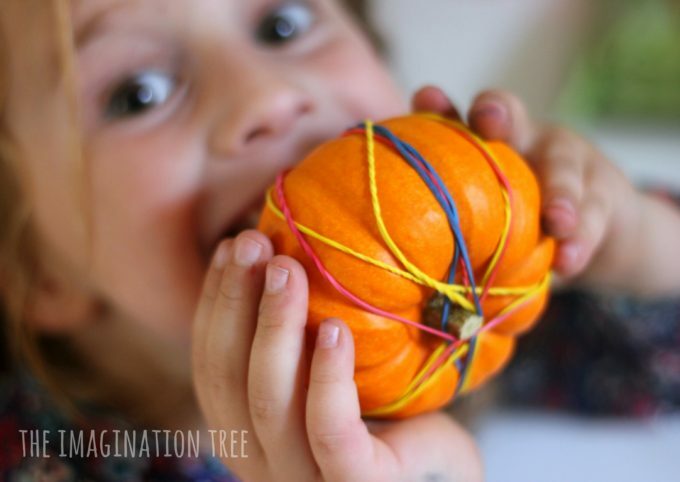 After wrapping in rubber bands paint the pumpkins. Let dry, remove rubber bands. Observe patterns left by rubber bands. Builds observation skills, small motor and vocabulary. This was a huge hit with my two three-year olds. My one and two year olds were a bit too young for it, but they like imitating what the “big kids” were doing. Even our seven year old neighbor liked it. 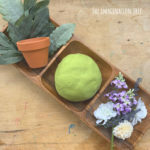 I’m glad I just found an alternate activity to do with the mini pumpkins we painted like three weeks ago!